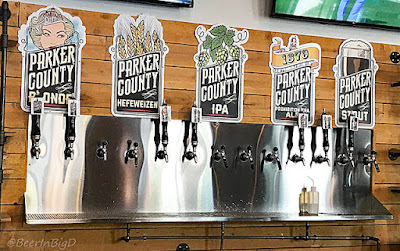 Turn back the clock on beer production in Parker County, and you'll find the name William F. Both attached to an entity that existed in Weatherford during the late 1800s. His firm, known as W.F. Both & Co., produced less than 50 barrels in 1878, making it the smallest licensed brewery in Texas at the time. Both's death in 1879 brought an end to that operation, and effectively put a cap on Parker County beer production for the next 139 years. 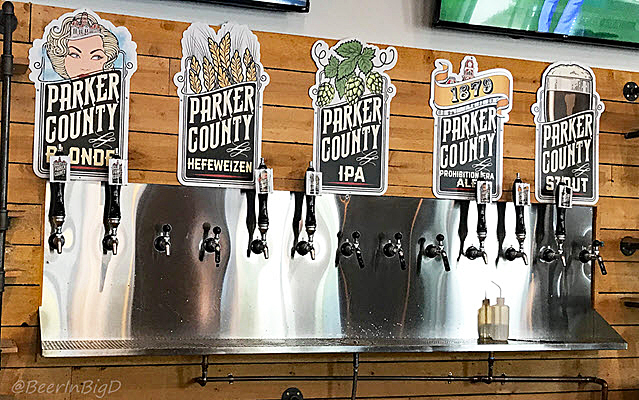 Local brews started flowing again in March, though, with the opening of Parker County Brewing Co. (PCBC) in Willow Park. Ryan Stewart and Joshua Tarbay have partnered on the modern-day project, which they've designed with a simple and straightforward approach, letting tradition take precedence in the creation of offerings centered around the classic combination of pizza and beer. PCBC's production setup is anchored by a 10-barrel brewhouse (left). Hand-pulled pours, like this cask brown ale, are a popular attraction at PCBC (right). Photos: © Brian Brown/Beer in Big D.
With regards to the latter, the brewpub's recipes tend towards the stylistic, with an everyday lineup including a blonde, a hefeweizen, an IPA and a stout. The best of the bunch, though, might be PCBC's 1879 Prohibition-Era Ale, an agreeable amber brew that recalls the end date of Both's enterprise mentioned above. Beyond those beers, options extend to a chocolate hazelnut porter and a just-tapped double IPA, not to mention seasonals like the current rotator, Peach Blonde. The brewpub also features a set of cask engines, a rarity for North Texas, with both hoppy and malty varieties available for hand-pulled pours. As for the food aspect of PCBC, Neapolitan pizzas are the primary output of a house kitchen. Couple that with a growler fill from the bar, or the purchase of 16-ounce cans seamed onsite, and it would appear to make PCBC a convenient stop for locals craving a pie and a pint to-go. Of course, that works for wanderers as well, especially those seeking out a craft beer destination west of Fort Worth.